Monarchs are still easy to find in the gardens of Cape May Point. Monarch numbers continue to be modest in Cape May, and with each passing day it seems more and more likely that the last big surge of migrating monarchs has already passed through the Point. But historically we have seen big migrations in mid-October, and a cold front has just passed through the Cape, bringing northwest winds that fuel most of our big migrations. So if the season has one more surge of monarchs to bring us, we're likely to see them this afternoon. We'll update when we have a clear sense of what's happening. One thing for sure, Cape May is not without monarchs, they are still easy to find around the gardens and dunes of Cape May Point. Last Sunday was our last tagging demo for the season. 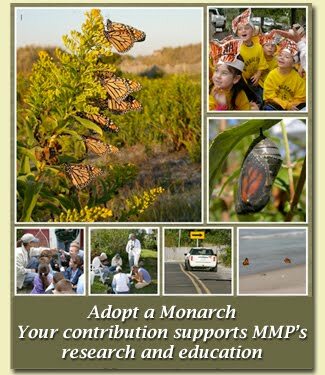 Thanks to all who came to participate this year -- we love a chance to share the monarch story! Three photos below are from Sunday's demo. and a description of our project. Louise Zemaitis tags a monarch while a studious young biologist watches.